Illinois is currently in a debt crisis. The election coming in November is very important, as citizens will be electing new representatives to act as our voice, as well as either re-electing Bruce Rauner or voting in J.B. Pritzker. I personally believe that Illinois would be in a better economic position if we vote in Pritzker for governor, and that is why I will be voting for him. 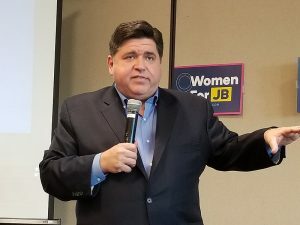 Pritzker is in favor of a graduated tax system. Raising taxes on the rich and other people who can afford those higher taxes, will allow lower income Illinoisans to survive in a state with an unemployment rate higher than the national average. On June 25th, 2015, Rauner vetoed 19 bills that would outline the fiscal year for Illinois and detailed a total state deficit to be about 4 dollars which certainly didn’t help our current debt crisis. Without a formal budget, there would be only an extremely loose-cut plan to what gets cut, and what won’t. Pensions, healthcare, and even education are some of the notable areas that got cut, and Illinois’ credit has been decreasing very quickly due to those cuts. Now it has the lowest credit rating of any U.S. state. Pritzker, who many times stated the values and importance of public education, wants to support it. He wants to commit more money towards investments in public education, but with Rauner’s current tax and budget plans, the same system just cannot survive without a change in the way taxes are run in Illinois. With an overall higher tax revenue, Pritzker could also use the money to support healthcare and pensions, attempting to restore any damage done by Rauner, in addition to loosening the taxes on the approximate 13 percent of Illinoisans living in poverty. I believe that a lot of Illinois’ problems can be fixed with a graduated taxing system. Although Rauner’s intentions were good by not allowing the budget to go in his eyes “unbalanced” and not forcing Illinois into even more debt than it’s at the time one hundred billion dollars, his stubbornness is what caused the crisis to plummet more so than ever and cutting education was just not the answer.